Several hundred workers from labor groups under the coalition Nagkaisa are marching this afternoon along Ayala Ave. to dramatize the call for job security and a living wage as their way of commemorating World Decent Work Day. The marchers will assemble at the Makati Fire Station at 3:00 pm and then will march by 4:00 pm around the country’s premier business district. 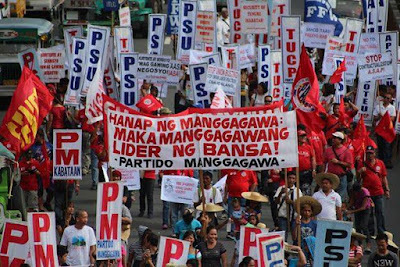 The militant Partido Manggagawa (PM) is challenging politicians to spell out platforms addressing voters’ urgent concerns on the erosion of wages due to inflation and the generation of regular jobs. “Everyday we see candidates declaring their intent to run but we hardly hear their platform for workers and the poor. Para lumawak ang tuwid na daan, manggagawa naman! Para walang maiiwan, manggagawa naman! Ang Makati, hindi lang dapat paraiso sa mga negosyante, manggagawa naman! We dare the national candidates to state what concrete steps they will do to resolve the problem of wages and jobs,” averred Rene Magtubo, PM chairperson. “Concretely, we are asking candidates to make a stand on the security of tenure bill meant to regulate the abusive practice of contractualization. 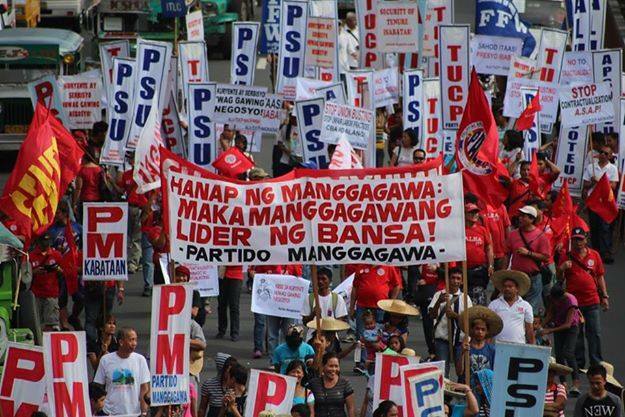 And also their commitment to achieving a living wage through a combination of wage hikes, basic goods discounts, tax exemptions and social security subsidies,” Magtubo clarified. For this year, the World Decent Work Day has a theme of “End Corporate Greed.” The call for decent work is given a local flavor by a recent survey that reveals the most pressing issues of Filipino voters are inflation, wages and employment. “What is the use of economic growth if wages are frozen, and jobs are not enough and contractual in status? Para sa totoong pag-unlad, manggagawa naman! Handa ba ang mga kandidato na salubungin ang Apat na Dapat?,” Magtubo argued. “In PAL, more than 5,500 workers have been retrenched in a series of mass layoffs since 1998 and they were all replaced by agency contractuals in a brutal outsourcing scheme meant to bust unions. Yesterday contractuals, called talents, in GMA-7 won their regularization case. This followed a similar move in 2010 by ABS-CBN talents for recognition as regular workers. From malls to factories to offices, contractuals are supplanting regulars. So we ask the candidates, ok ba silang endo pa more?,” Magtubo ended.